"What's that?" said the Jew. "What do you watch me for? . . . "
"What's that?" said the Jew. "What do you watch me for?" Dickens's The Adventures of Oliver Twist, Household Edition, vol. 1 frontispiece. As the Jew uttered these words, his bright dark eyes, which had been staring vacantly before him, fell on Oliver's face; the boy’s eyes were fixed on his in mute curiosity; and although the recognition was only for an instant — for the briefest space of time that can possibly be conceived — it was enough to show the old man that he had been observed. "What's that?" said the Jew. "What do you watch me for? Why are you awake? What have you seen? Speak out, boy! Quick — quick! for your life." "I wasn't able to sleep any longer, sir," replied Oliver, meekly. "I am very sorry if I have disturbed you, sir." You were not awake an hour ago?" said the Jew, scowling fiercely on the boy. "No! No, indeed!" replied Oliver. "Are you sure?" cried the Jew: with a still fiercer look than before: and a threatening attitude. "Tush, tush, my dear!" said the Jew, abruptly resuming his old manner, and playing with the knife a little, before he laid it down; as if to induce the belief that he had caught it up, in mere sport. "Of course I know that, my dear. I only tried to frighten you. You're a brave boy. Ha! ha! you're a brave boy, Oliver." The Jew rubbed his hands with a chuckle, but glanced uneasily at the box, notwithstanding. "Did you see any of these pretty things, my dear?" said the Jew, laying his hand upon it after a short pause. "Ah!" said the Jew, turning rather pale. "They — they're mine, Oliver; my little property. All I have to live upon, in my old age. The folks call me a miser, my dear. Only a miser; that's all. "— Chapter IX, "Containing Further Particulars Concerning the Pleasant Old Gentleman, and His Hopeful Pupils," Household Edition, vol. 1, p. 103-104. Although Darley's frontispiece is beautiful as an independent work of art, it also serves to underscore the essential motivation of one of the novel's chief villains, the notorious fence, betrayer of thieves, and criminal mastermind, Fagin. 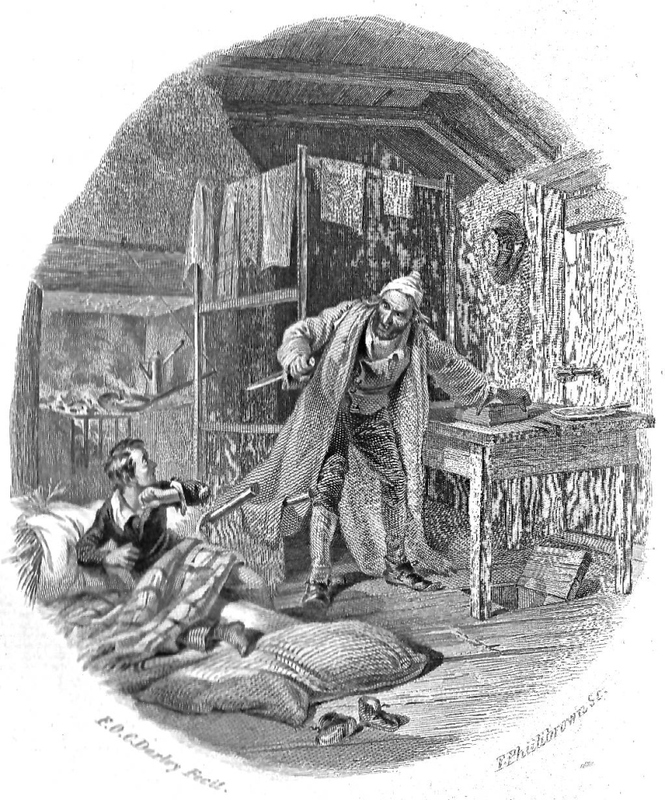 With a scheme that permitted him but one or two opportunities to realise scenes in the short novel of just two volumes in the New York 'Household' Edition, like Diamond Edition illustrator Sol Eytinge, Junior in the frontispiece for the volume in the 1867 Ticknor and Fields edition, Darley shows the secretive underworld figure as he first appears to Oliver just after the boy arrives in London accompanied by the Artful Dodger. 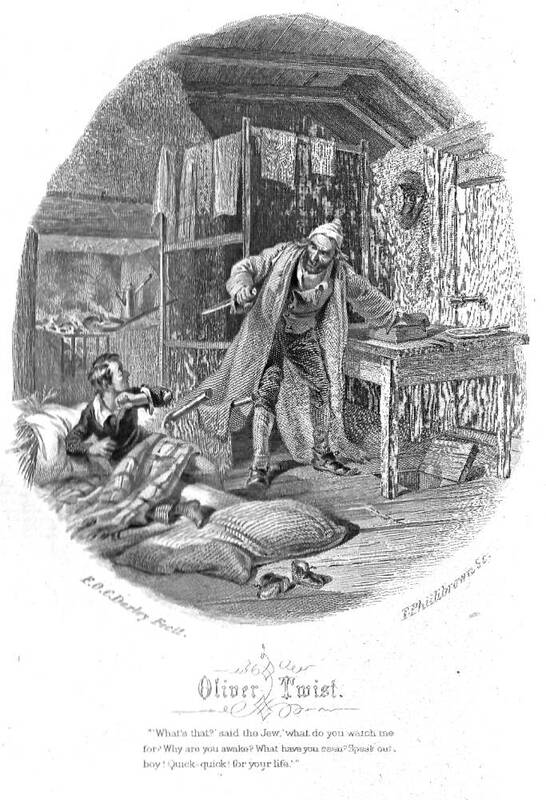 Felix O. C. Darley, then, selected for illustration a scene which gives the American reader of the 1860s considerable insight into Fagin's villainy, the product of indigence and want rather than mere viciousness. 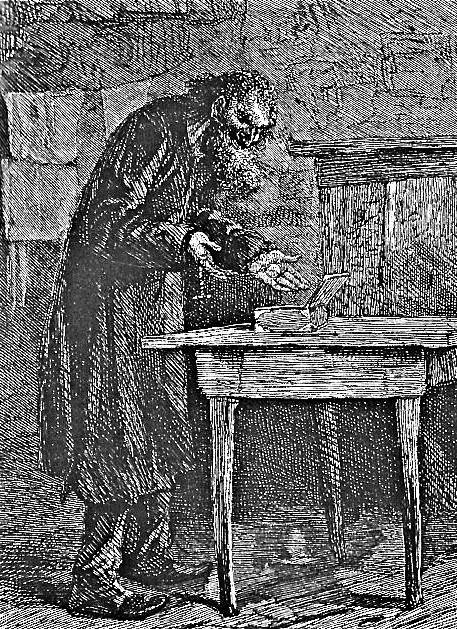 The character of Fagin is hardly a Dickens — or, for that matter, a George Cruikshank — original, for such thief-takers, fences, and master criminals were commonplace in London lore and street gazettes. 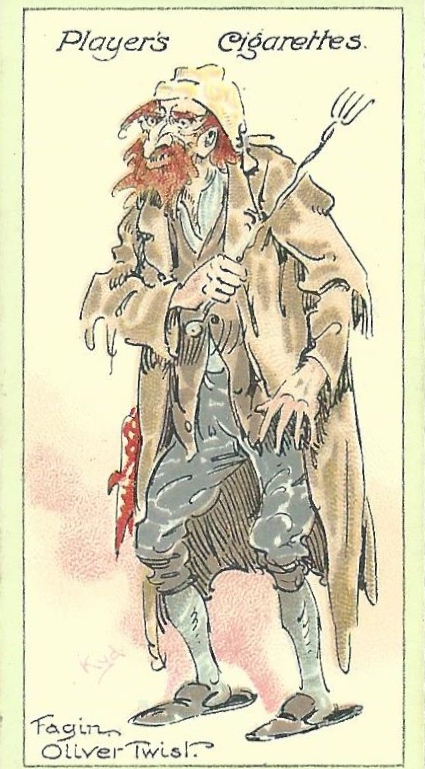 Dickens may have based Fagin partly upon the fence and thief-taker Peachum in John Gay's The Beggar's Opera (1726) and partly upon such actual nefarious characters from the police gazettes such as Ikey Solomon (1787-1850), born in the east end of London and notorious as a receiver of stolen goods. However, unlike Fagin, he was a practising Jew and successfully avoided capture on a number of occasions before giving up his freedom in the United States to join his wife, who had been sentenced to transportation to Tasmania (in those days, Van Diemen's Land). Thanks in part to Lionel Bart's West End production (1960) and David Merrick's Broadway (1963) musical Oliver! (perhaps based more on David Lean's 1948 cinematic adaptation rather than directly on Dickens's novel, and made into a widely circulated film in 1968, with Ron Moody starring as Fagin), like The Artful Dodger, Fagin is now part of our popular culture, and remains one of Dickens's most frequently illustrated and most recognizable characters. 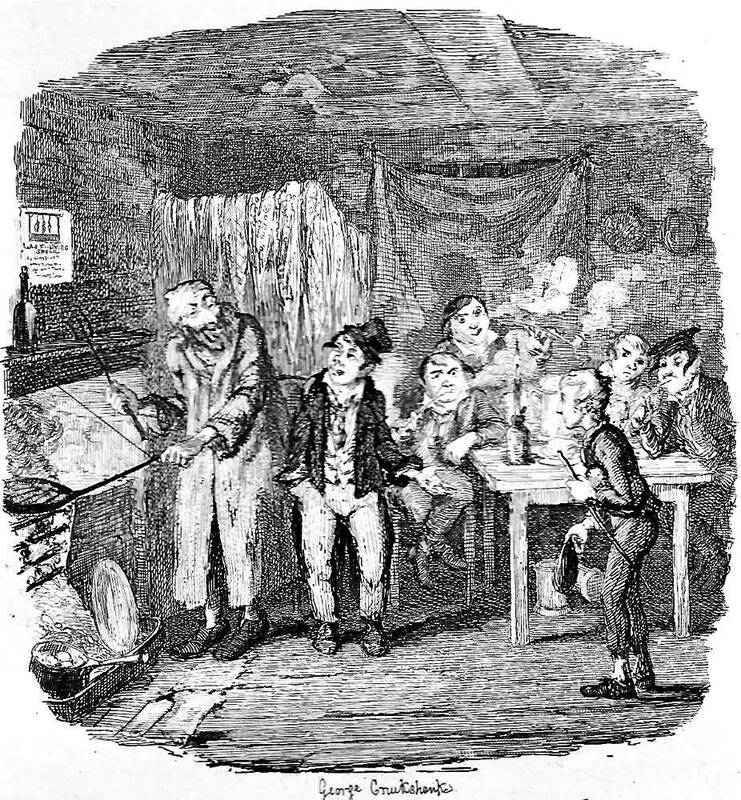 Darley's American readers would have long been familiar with Fagin, Bill Sikes, Nancy, the Artful Dodger, and the other characters in the story through numerous dramatic adaptations from 1839 onward. Not surprisingly, given their proximity to London by ship, the first American theatres to stage productions of the novel, just as it wound up its initial serial run, were The St. Charles in New Orleans (24 March 1839) and The Tremont in Boston (15 April 1839). The Chicago Theater was the next American venue for a production of Oliver Twist (16, 18, and 24 September 1839), after which the same company (with Joseph Jefferson as Bumble and William Warren as Sikes) took the production to St. Louis, Missouri (March 1840). There followed stage adaptations at New York City's Park Theater (February-March, and June 1840), Philadelphia (1840-41, and at The Walnut Street Theater in 1842-43, and again in 1844), New York City's Bowery Theater (July 1844 and again in 1857), The Boston Museum (February and July 1849), in San Francisco (August 1858), and (undated) in Troy, NY. Immediately prior to the publication of the New York 'Household Edition' volumes, Joseph Jefferson reprised his role as Bumble at The Winter Garden, New York City (2-18 February 1860), following another company's production in January 1859 at Burton's Triple Hall (which became The Winter Garden the following year). 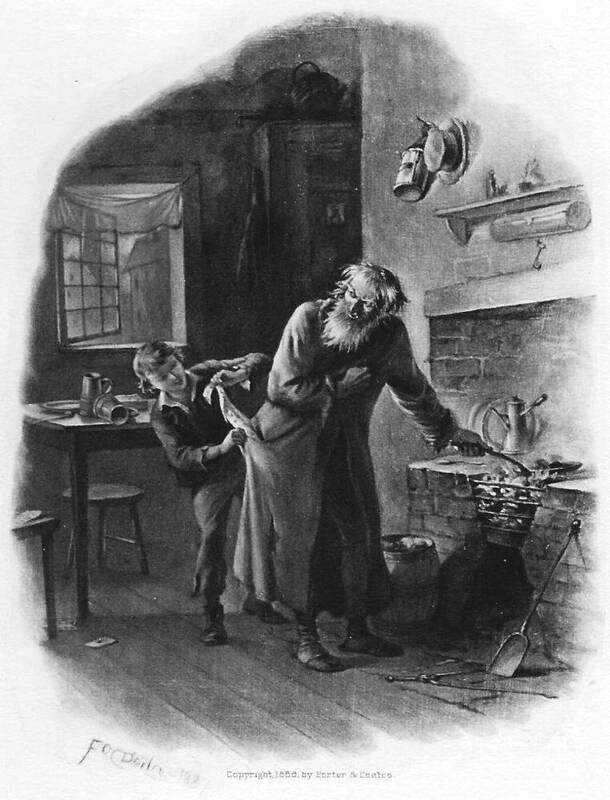 As opposed to the stage-worthy scenes in the thieves' den, with the "merry old gentleman" cooking for the boys and acting as a surrogate parent as he engages them in games that prepare them for the pickpocketing trade, Darley's present subject suggests that Fagin, like Oliver, is a social isolate who has had to keep a constant eye to the main chance in the East End's mean streets. Both Fagin and Oliver are startled. The miser grasps his cash-box as Oliver instinctively raises his arm in self-defense as Fagin momentarily menaces him with a dagger. Behind them both is the chief source of his wealth, purloined silk handkerchiefs drying on a rack. In contrast, avoiding providing much detail for the backdrop, Harry Furniss highlights the four figures as he gives us a "freeze-frame" in which he captures all four characters in motion; Oliver, no longer the victim, is being entertained as he seems to have found a home and family at last. That he is deluded in so thinking will become shortly apparent. 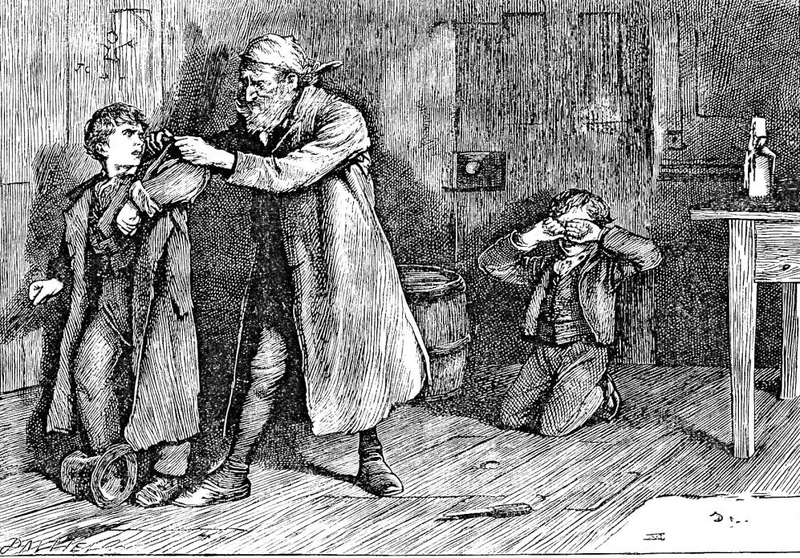 An extension of this scene, which Darley provides in his 1888 Character Sketches from Dickens, is Oliver's trying out his own pickpocketing skills on a playful Fagin, a scene which perhaps undermines the naiveté with which Dickens invests Oliver in the Thieves' Kitchen, for only when he observes The Dodger and Charley Bates preparing to rob the book-loving "cove" at The Green does it dawn on Oliver what the true object of the old gentleman's game must be. Bolton, Philip H. Dickens Dramatized. Boston, Mass., and London: G. K. Hall and Mansell, 1987. Dickens, Charles. The Adventures of Oliver Twist. Works of Charles Dickens. Household Edition. 55 vols. Illustrated by​F. O. C. Darley and John Gilbert. New York: Sheldon and Co., 1861. 2 vols. Dickens, Charles. The Adventures of Oliver Twist. Works of Charles Dickens. Diamond Edition. 14 vols. Illustrated by Sol Eytinge, Jr. Boston: Ticknor and Fields, 1867. Dickens, Charles. The Letters of Charles Dickens. Ed. Graham Storey and​Kathleen Tillotson. The Pilgrim Edition. Oxford: ​ ​ Clarendon, 1965. Vol. 1 (1820-1839). Forster, John. "Oliver Twist 1838." The Life of Charles Dickens. Ed. B. W. Matz. The Memorial Edition. 2 vols. Philadelphia: J. B. Lippincott, 1911. Vol. 1, book 2, chapter 3. Kyd. Characters from Dickens. Nottingham: John Player & Sons, 1910.